Our flag has been getting a lot of attention lately. From flag waving to burning to football players refusing to stand for it during the National Anthem. President Trump entered into the conversation (via Twitter) to say those players should be fired. His comments gather momentum from Americans who resoundingly agree, but it also ignites another side to a First Amendment debate. In 1969 the US Supreme Court determined that burning a flag is protected as freedom of speech. That never set well with a lot of Americans and in 2005 an Amendment passed in the House to make flag burning illegal. It failed in the Senate, however, and even Republican Senator Mitch McConnell argued against it. “The vast majority of Americans honor the flag, and rightly so. Some would go so far as to amend the Constitution to protect the flag against those who would burn it. While I share and admire their patriotism, altering our First Amendment, even for the worthy purpose of protecting the flag, is not a position I can support. How ever we look at the flag, it is a flashpoint for people who feel betrayed by it, people who are inspired by it, people who are afraid of it, and people who stand by it. 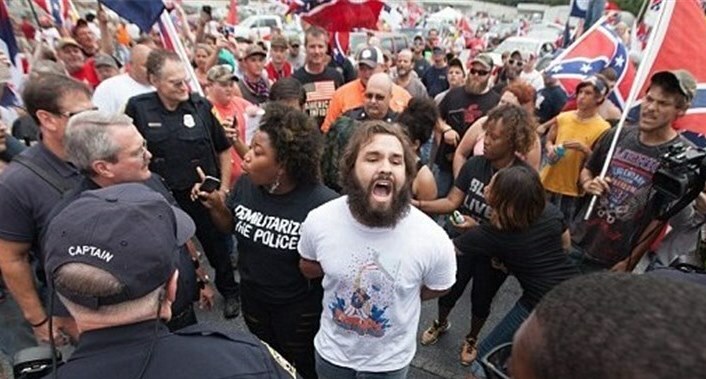 The flag was burned three years ago in Ferguson, Missouri by people who felt America does not provide equal protection of freedom and justice and it appears to them as a betrayal of that promise. 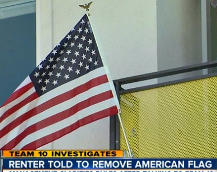 A flag was taken down by a university where a student displayed it on his campus porch because to foreign students passing by it represented a form of nationalist patriotism that doesn’t welcome them. It scared them and the university agreed. So the question is: What is American freedom? That’s not easy to answer. American freedom, even as it’s outlined in our Constitution, is a vague construct. Freedom to do what, exactly? Live free? What if my free imposes on your free? Freedom to worship? What if your beliefs deny my beliefs? Freedom of speech? What if that speech promotes the restriction of freedom for others? Freedom from government tyranny? Sure…but, government was also created to keep us free from…government tyranny. I’m not trying to be pedantic here, but there are conundrums inherent to the very concept of the freedoms we defend. All we can actually believe in is an idea of freedom, but ideas are not always clearly defined. What we are believing in is not a concrete set of principles, but the feeling we get when we consider our own personal identification with that idea. Good or bad. A national flag is a symbol of that nation. It is visual statement to identify the temperament, history, ideology and people comprising that nation. The US flag signifies, as stars, the 50 united-states, and has 13 stripes representing the original colonies that revolted against Britain. The history of that revolution, democratic representation, our sovereignty, along with the constitution binding those states with unalienable rights is woven into that fabric. But, therein lies the problem. A symbol is as perfect as it is benign; its realization is not. In the 1960’s a phrase entered our lexicon in answer to the protests against the Vietnam War: “America, Love It Or Leave It.” It was conservative-ideology shorthand to define American patriotism and it meant that if you don’t like the way America handles its business, you should go (or stay) elsewhere. It was draped around our symbol; the flag. There was a double-standard as easily revealed as its patriotic intention as those saying it usually hated any government representation that wasn’t from their own party. But it was nevertheless embraced by many because it made them feel good about their personal connection with America. And they proudly waved their flag. During that time, however, conservatism was in the shadow of an emerging liberalism that began after World War II and reached its zenith during the Machiavellian, ethics-defying presidency of Richard Nixon. In the 60’s and 70’s it became more culturally relevant to be liberal. “America, Love It Or Leave It” endured, but it was a bumper sticker confined to the more extreme right wing. That is until a new revolution came along; an ideological revolution from 30 years of pent up conservative nationalism: The Reagan Revolution. President Reagan, more than any other president (or at least as much as any) galvanized a decaying nationalist spirit and he turned a disenfranchised form of patriotism into something positive. He made a lot of Americans feel good again about being an American. 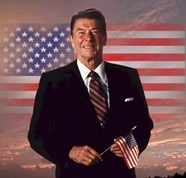 Even though many of us did not believe in Reagan’s jingoistic interpretation of American exceptionalism and we bristled at the wealth-pandering, class-separation he helped create, it was undeniable that a new conservative-patriotism was sweeping America. Being a “liberal” was now being labeled less patriotic. What it meant, initially, was that they supported the military action in Iraq taken by that President, but it soon transcended that limitation as it was folded into the centerpiece of the sentiment; the bravery of the men and women in uniform. The flag was part and parcel again with every representation of that statement. It doesn’t necessarily mean support of the government (of which our military is part). Or support of their Commander in Chief. It doesn’t mean support of the foreign policy directives those troops have been called to establish or defend. It doesn’t even mean domestic support of our troops with better health, job or education benefits. It succeeds as socio-political panacea because there is no greater rapture of true patriotism than from the acknowledgment of those who are willing to stand in harm’s way to protect us, and that cannot be argued. Anyone standing next to me at a football game will know that I sing our National Anthem (loudly), and will see that my hat is in my left hand and my right hand is on my heart. They will also see me making sure that my sons do the same. I do this to show respect, humility and sincere love for our nation. 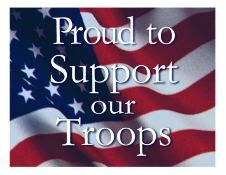 I do this to support our troops, and our citizens, in our joined fight for freedom. I look at our flag as I sing “The Star Spangled Banner” (with its traditional patriotic understanding). When I sing “The land of the free and the home of the brave” it is with the sincere belief that we really can stand as a nation in support of that ideal. And I also realize that to some people that ideal has been lost or has never been realized. They are saying that we cannot be the “land of the free and the home of the brave” if only for some. They remind us that a flag is only cloth flapping in the wind unless the nation that flies it is true to its purpose. We can argue either way, but the bottom line is that our flag symbolizes the idealism of a Republic and the spirit of freedom that carried our nation to sovereignty, but it can also contain the divisiveness, separation and fear that can result from exclusionary nationalism. And so…what is that freedom it represents? It is all of the above. It has contradictions, vagueries, truths, triumphs, defeats, promises, shortcomings, and inspirations. The sum of all of these gradations is the freedom to protest, even to burn a flag, and the freedom to be repulsed by that action. Our flag is powerful because we have the freedom to interpret its symbolism in whatever way our experience compels us. The flag belongs to all of us to wave proudly or to protest. And that makes some people really angry. One way or another. You must be <a href="http://garyhasissues.com/wp-login.php?redirect_to=http%3A%2F%2Fgaryhasissues.com%2F2017%2F09%2Fwhat-so-proudly-we-hail%2F">logged in</a> to post a comment.